MyStompz is available for iPhone and iPad. 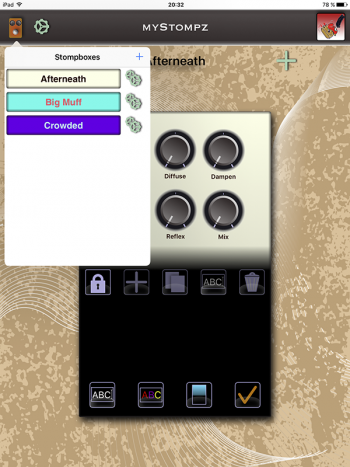 It allows you to recreate the layout of your effects pedals. You can then store your pedal settings and never lose them again. Forget about taking pictures that take forever to find once they are among hundreds of other pictures. Forget about taking notes on papers you eventually will lose. Forget about drawing marks on your stomp boxes. With MyStompz you can retrieve your stomp box settings in seconds! This is the iPad version – Stompbox List.